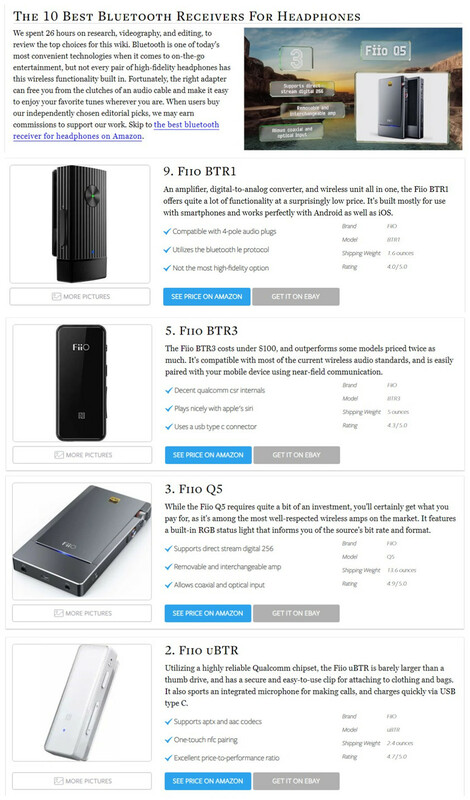 FiiO Products Chosen in 10 Best Bluetooth Receiver For Headphone By Ezvid Wiki - Hot news - FiiO Forums - Powered by Discuz! About Ezvid Wiki: Established in 2011, Ezvid Wiki has grown from a small user-generated forum into the largest and most comprehensive video wiki on the planet, providing useful, unbiased information and actionable guidance to hundreds of millions of people around the world, in thousands of knowledge categories. Editor's Notes: Now that most flagship smartphones have ditched the 3.5-millimeter audio jack (with a rather loud chorus of, "Sorry, not sorry! "), it may be time to upgrade your on-the-go music setup with a good Bluetooth receiver. This name list was selected after spending 26 hours on research, videography, and editing, to review the top choices for this wiki. Bluetooth is one of today's most convenient technologies when it comes to on-the-go entertainment, but not every pair of high-fidelity headphones has this wireless functionality built in. Fortunately, the right adapter can free you from the clutches of an audio cable and make it easy to enjoy your favorite tunes wherever you are. GMT+8, 2019-4-25 22:16 , Processed in 0.022981 second(s), 23 queries .